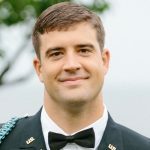 Dan graduated from the United States Military Academy in 2012 with a major in Engineering Management. Upon graduation, Dan commissioned as infantry and was stationed in Fort Carson, Colorado with 2nd Brigade, 4th Infantry Division. Following that assignment, he was stationed in Savannah, GA with 1st Battalion, 75th Ranger Regiment. He has served as a Rifle Platoon Leader, Scout Platoon Leader, Ranger Platoon Leader, Ranger Company Executive Officer, and Ranger Staff Officer. Dan deployed twice to Afghanistan. He will be pursuing his MBA at Harvard Business School as a member of the Class of 2019.